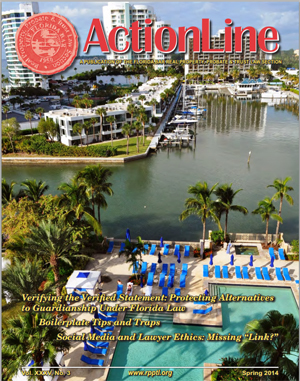 The Real Property, Probate and Trust Law Section’s ActionLine is a quarterly publication containing the latest news on Florida law of concern to our members and reporting on current Section activities. As a Section member you can download current and previous issues of ActionLine and search for specific articles on the publication’s search engine. Enhance your professional knowledge and expertise by reading ActionLine to keep up to date and as a research tool. Want to be included in Actionline as an author, photographer or advertiser? Click here for details.